The Soviet Union was dissolved on December 26, 1991. It was a result of the declaration number 142-Н of the Soviet of the Republics of the Supreme Soviet of the Soviet Union. The declaration acknowledged the independence of the former Soviet republics and created the Commonwealth of Independent States (CIS), although five of the signatories ratified it much later or did not do it at all. On the previous day, Soviet President Mikhail Gorbachev, the eighth and final leader of the Soviet Union, resigned, declared his office extinct, and handed over its powers – including control of the Soviet nuclear missile launching codes – to Russian President Boris Yeltsin. That evening at 7:32, the Soviet flag was lowered from the Kremlin for the last time and replaced with the pre-revolutionary Russian flag. Previously, from August to December, all the individual republics, including Russia itself, had seceded from the union. The week before the union's formal dissolution, 11 republics signed the Alma-Ata Protocol formally establishing the CIS and declaring that the Soviet Union had ceased to exist. The Revolutions of 1989 and the dissolution of the USSR (Russian: распад СССР) also signalled the end of the Cold War, which left the United States as the world's only superpower. Several of the former Soviet republics have retained close links with the Russian Federation and formed multilateral organizations such as the Commonwealth of Independent States, Eurasian Economic Community, the Union State, the Eurasian Customs Union, and the Eurasian Economic Union to enhance economic and security cooperation. Some have joined NATO and the European Union. This liberalisation, however, fostered nationalist movements and ethnic disputes within the Soviet Union. It also led indirectly to the revolutions of 1989, in which Soviet-imposed communist regimes of the Warsaw Pact were peacefully toppled (Romania excepted), which in turn increased pressure on Gorbachev to introduce greater democracy and autonomy for the Soviet Union's constituent republics. Under Gorbachev's leadership, the Communist Party of the Soviet Union in 1989 introduced limited competitive elections to a new central legislature, the Congress of People's Deputies (although the ban on other political parties was not lifted until 1990). In May 1985, Gorbachev delivered a speech in Leningrad advocating reforms and an anti-alcohol campaign to tackle widespread alcoholism. Prices of vodka, wine, and beer were raised in order to make these drinks more expensive and a disincentive to consumers, and the introduction of rationing. Unlike most forms of rationing intended to conserve scarce goods, this was done to restrict sales with the overt goal of curtailing drunkenness. Gorbachev's plan also included billboards promoting sobriety, increased penalties for public drunkenness, and to censor drinking scenes from old movies. Some noted this mirrored Tsar Nicholas II's program during World War I, as that was also intended to eradicate drunkenness in order to bolster the war effort, although that was also intended to redirect grain usage for only the most essential purposes, which did not appear to be a goal in Gorbachev's program. However, Gorbachev soon faced the same adverse economic reaction to his prohibition as did the last Tsar. The disincentivization of alcohol consumption was a serious blow to the state budget according to Alexander Yakovlev, who noted annual collections of alcohol taxes decreased by 100 billion rubles. Alcohol production migrated to the black market, or through moonshining as some made "bathtub vodka" with homegrown potatoes. Poorer, less educated Russians resorted to drinking unhealthy substitutes such as nail-polish remover, rubbing alcohol or men's cologne, which only served to be an additional burden on Russia's healthcare sector due to the subsequent poisoning cases. The purpose of these reforms, however, was to prop up the existing centrally planned economy, unlike later reforms, which tended toward market socialism. On July 1, 1988, the fourth and last day of a bruising 19th Party Conference, Gorbachev won the backing of the tired delegates for his last-minute proposal to create a new supreme legislative body called the Congress of People's Deputies. Frustrated by the old guard's resistance, Gorbachev embarked on a set of constitutional changes to try to separate party and state, and thereby isolate his conservative Party opponents. Detailed proposals for the new Congress of People's Deputies were published on October 2, 1988, and to enable the creation of the new legislature the Supreme Soviet, during its November 29 – December 1, 1988, session, implemented amendments to the 1977 Soviet Constitution, enacted a law on electoral reform, and set the date of the election for March 26, 1989. The Estonian Popular Front was founded in April 1988. On June 16, 1988 Gorbachev replaced Karl Vaino, the "old guard" leader of the Communist Party of Estonia, with the comparatively liberal Vaino Väljas, the Soviet ambassador to Nicaragua. In late June 1988, Väljas bowed to pressure from the Estonian Popular Front and legalized the flying of the old blue-black-white flag of Estonia, and agreed to a new state language law that made Estonian the official language of the Republic. On February 20, 1988, after a week of growing demonstrations in Stepanakert, capital of the Nagorno-Karabakh Autonomous Oblast (the Armenian majority area within Azerbaijan Soviet Socialist Republic), the Regional Soviet voted to secede and join with the Soviet Socialist Republic of Armenia. This local vote in a small, remote part of the Soviet Union made headlines around the world; it was an unprecedented defiance of republican and national authorities. On February 22, 1988, in what became known as the "Askeran clash", two Azerbaijanis were killed by Karabakh police. These deaths, announced on state radio, led to the Sumgait Pogrom. Between February 26 and March 1, the city of Sumgait (Azerbaijan) saw violent anti-Armenian rioting during which 32 people were killed. The authorities totally lost control and occupied the city with paratroopers and tanks; nearly all of the 14,000 Armenian residents of Sumgait fled. In late February, large public rallies took place in Kiev to protest the election laws, on the eve of the March 26 elections to the USSR Congress of People's Deputies, and to call for the resignation of the first secretary of the Communist Party of Ukraine, Volodymyr Shcherbytsky, lampooned as "the mastodon of stagnation." The demonstrations coincided with a visit to Ukraine by Soviet President Gorbachev. On February 26, 1989, between 20,000 and 30,000 people participated in an unsanctioned ecumenical memorial service in Lviv, marking the anniversary of the death of 19th Century Ukrainian artist and nationalist Taras Shevchenko. In June 1990, Osh and its environs experienced bloody ethnic clashes between ethnic Kirghiz nationalist group Osh Aymaghi and Uzbek nationalist group Adolat over the land of a former collective farm. There were about 1,200 casualties, including over 300 dead and 462 seriously injured. The riots broke out over the division of land resources in and around the city. The bloody attacks in Lithuania prompted Latvians to organize defensive barricades (the events are still today known as "The Barricades") blocking access to strategically important buildings and bridges in Riga. Soviet attacks in the ensuing days resulted in six deaths and several injuries; one person died later. When Estonia had officially restored its independence during the coup (see below) in the dark hours of August 20, 1991, at 11:03 pm Tallinn time, many Estonian volunteers surrounded the Tallinn TV Tower in an attempt to prepare to cut off the communication channels after the Soviet troops seized it and wouldn’t let themselves to be intimidated by the Soviet troops. When Edgar Savisaar confronted the Soviet troops for ten minutes, they finally retreated from the TV tower after the failed resistance against the Estonian people. On December 12, the Supreme Soviet of the Russian SFSR formally ratified the Belavezha Accords and renounced the 1922 Union Treaty. It also recalled the Russian deputies from the Supreme Soviet of the USSR. The legality of this action was questionable, since Soviet law did not allow a republic to unilaterally recall its deputies. However, no one in either Russia or the Kremlin objected. Any objections from the latter would have likely had no effect, since the Soviet government had effectively been rendered impotent long before December. In effect, the largest and most powerful republic had seceded from the Union. Later that day, Gorbachev hinted for the first time that he was considering stepping down. On December 17, 1991, along with 28 European countries, the European Community, and four non-European countries, the three Baltic Republics and nine of the twelve remaining Soviet republics signed the European Energy Charter in the Hague as sovereign states. On the night of December 25, at 7:32 p.m. Moscow time, after Gorbachev left the Kremlin, the Soviet flag was lowered for the last time, and the Russian tricolor was raised in its place, symbolically marking the end of the Soviet Union. On that same day, the President of the United States George H.W. Bush held a brief televised speech officially recognizing the independence of the 11 remaining republics. On December 26, the upper chamber of the Union's Supreme Soviet voted both itself and the Soviet Union out of existence. (the lower chamber, the Council of the Union, had been unable to work since December 12, when the recall of the Russian deputies left it without a quorum). The following day Yeltsin moved into Gorbachev's former office, though the Russian authorities had taken over the suite two days earlier. 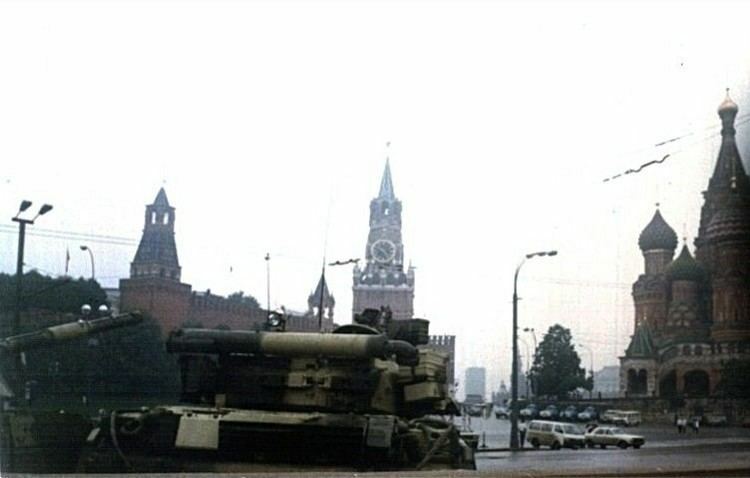 By the end of 1991, the few remaining Soviet institutions that had not been taken over by Russia ceased operation, and individual republics assumed the central government's role. Structuralist accounts, by contrast, take a more deterministic view, in which Soviet dissolution was an outcome of deeply-rooted structural issues, which planted a 'time-bomb'. For example, Stephen Walker has argued that while minority nationalities were denied power at the Union level, confronted by a culturally-destabilizing form of economic modernization, and subjected to a certain amount of Russification, they were at the same time strengthened by several policies pursued by Soviet regime (such as indigenization of leadership, support for local languages, etc.) – which over time created conscious nations. Furthermore, the basic legitimating myths of the Soviet Union federative system – that it was a voluntary and mutual union of allied peoples – eased the task of secession/ independence. On January 25, 2016, Russian president Vladimir Putin supported this view, calling Lenin's support of the right of seccesion for the Soviet Republics a "delay-action bomb".